I’m struggling to write this review, because I’m worried that my words won’t adequately represent the subtle charms of a film like In the Courtyard. Although it is extremely French at its core, the film’s themes are universally relatable, with performances from the leads most effective through the silent expressiveness of their faces. There is a lot about the structure of this narrative which aligns with the dramedy style found in a majority of American independent cinema, combing awkward humor and familiar pangs of realistic struggle. This is recognizable in any language, regardless of ethnicity or nationality. When an aging musician named Antoine (Gustave Kervern) suddenly decides to retire in the middle of a gig, he takes to a life of odd jobs until taking the position of caretaker for an old residential building in Paris. He is hired by the head of the homeowner’s association, Mathilde (Catherine Deneuve), whose recent retirement has led to an unhealthy obsession with the crack in her living room ceiling. These two inevitably build a kinship with each other, though it plays out in a way that is somewhat unexpected in an otherwise predictable narrative. The apartment building and surrounding area is filled with an assortment of quirky personalities, though each is tinged with a reminder of reality encroaching. The strange immigrant that belongs to a cult and constantly asks favors of Antoine is comical while also serving as a social reminder of the desperate need for optimism, even clinging to false promises and empty faith. There is the resident so convinced that he hears a dog in the apartment building’s courtyard that he takes to barking out of his window at night, insistently dedicated to the enforcement of the rules. Among these offenders of the building regulations is a resident storing stolen bicycles in the courtyard as a way to feed his drug habit. This is a drug habit shared by Antoine after years working as a musician, though the job as caretaker was meant to help him quit the habit. The result is a series of relapses, comically taking advantage of the back-and-forth process between highs and withdrawals. As Antoine fights to live a clean and simple life, he finds distraction in Mathilde’s misguided conquest to save the building from collapsing. Their friendship seems to give Antoine comfort and anxiety in equal form. 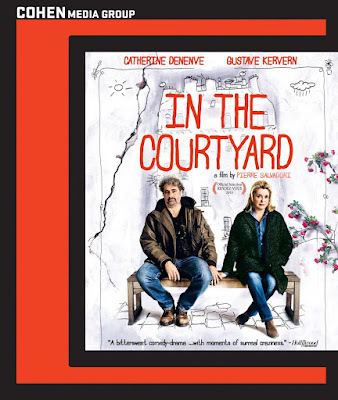 The Blu-ray release for In the Courtyard comes with a couple of extras and a slightly unnecessary high definition presentation of the film. There is an interview with the director, Pierre Salvadori (Priceless, Beautiful Lies), as well as the film’s trailer.